It’s one of those nasty summer colds that is trying to punch me in the face kinda sick. I had a great blog post planned that would make my writer friend salivate, but I was feeling much too yucky yesterday to get it done. I should be much better about getting my posts together far ahead of time, but I’m a MAJOR procrastinator. I work so much better under pressure, so I’m notorious for starting a project ahead of time but leaving the details until the last minute. Or in this case, blog posts. I have dreams of blogging weeks in advance. 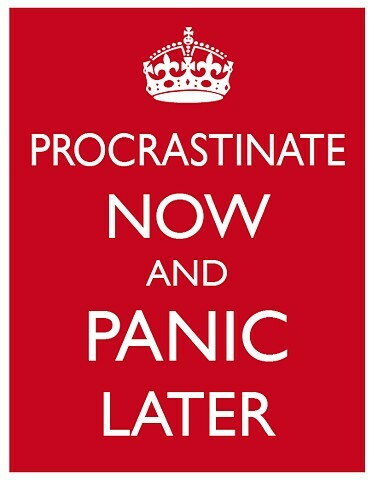 Share with me: Are you a procrastinator or do you get things done with time to spare? I always think I’m going to cut it close, but I’m ususally a time to spare person. Anxious. God’s working on me. Chug chug w/ the medicine. Praying it words for you. Show off. 🙂 And thanks! Meaning: I both work ahead. Sometimes. Love this. That’s kinda me. I work ahead a little, stop, always leave something for last minute, even if it’s just re-checking what I’ve already done. I’m a PROCRASTINATOR with a capital P! :p Feel better soon. Yay! Someone else who thinks like me. Thanks! Codeine can be your friend. I’m #justsayin. I’m definitely a procrastinator, except when I’m not.